I like to use the 4th of July as an excuse to be over-the-top patriotic. This look seriously couldn't be more me. I'm obsessed with the back of this little red dress from Modcloth, paired back to a navy statement necklace and some star studded flats! This is one of the first years I won't be up at my grandparent's lake house for the 4th, so I will have to compensate with going to see some fireworks and grilling out here! What are your 4th of July traditions.. and more importantly, what will you be wearing? I love the title of this post :). And as of late, I've been really loving the bows on the back of dresses. So girly and cute. AGHHH this is so adorable. Perfect for the 4th. My favorites are the bows in the back of the dress and the swell Caroline necklace. I'm obsessed with chunky necklaces so that's probably why. That dress is so pretty!!! 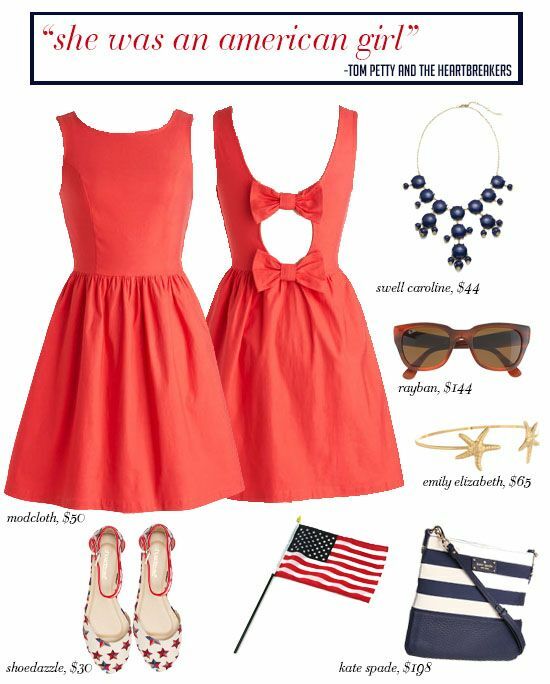 This is the perfect outfit for 4th of July!